Hi, I want to get a beautiful tree for my front garden. I am a little impatient so thinking of buying a semi mature tree and getting it planted. My budget would be about â‚¬500 - â‚¬600. Is it worth my while at that price range? Do trees vary a lot in price? I initially focused on the spreading copper acers but all reports seem to say they hate wind and while I dont live on the west coast of connemara I do live at the bottom of an urban grove which can get a bit windy. I'm now considering a copper weeping beech. Really I love the spreading habit of the acers and I love the tall columnar weeping appearance of the beech. I would consider other trees if they had those qualities! Any suggestions? Does anyone know a good nursery near Dublin that I could make enquiries with? The nurseries I've contacted so far are all over the country. Your advice much appreciated! Many thanks. More money than sense Nurseries will love you. and strike that is its ability to put on new root growth to feed the tree and stabilise it in the ground.It needs a lot of care and attention for the first two to three years and lots of water. Save your money and buy a 12/14 tree rootballed from a nursery and get it planted properly. Try Flannerys or caragh nurseries they have a large selection of home grown trees. Hmm, not sure I appreciate the comments on how I choose to use my money. A weeping beech is very slow growing and I don't fancy waiting 10-15 y before it looks good! But each to their own. I'll def check out those nurseries tho. A weeping ash? Fraxinus excelsior "pendula". Faster growing, resilient, and unusual. What kind of trees seem to do well in your area? It might help us determine what might be suitable, and what wouldn't stand a chance. I was not getting at how you spend your money everyone to their own but there are lots of Landscapers and nurseries who will take your money if they know your budget. You dont say how big the garden is and if it would take a weeping Beech which will eventually be a big tree and someone elses problem in the future. I reccomend FAgus sylvatica 'Dawyck Gold' If you get your quote let us know and I will post the wholesale price for you although it may get me in trouble with landscapers. The weeping beeches are proving horribly expensive for a decent size one, like â‚¬800 or so, ouch. Haven't found anyone doing them in Dublin yet, that tree would have to come from Cork so the delivery is expensive. One nursery suggested a parrotica persica which was half the price for a decent size one. Looks like an interesting tree, am thinking about it. I'm in south dublin, there's everything an anything around. Some neighbours round the corner have a lovely japanese maple which seems to do fine but the angle for wind would be different for me. House faces sw and is at bottom of a grove, so can get a bit windy from time to time. Otherwise, there's lilac, leylandii, those awful palm trees, we've a sycamore (deformed and stunted but still quite nice) in the back garden and there are loads of those around. Garden is long. Yes I know the beeches get v big, but they are v slow to grow (that's why it's so expensive for a big one apparrently) and there are lots of big trees around, nursery said it could be planted within 4m of house but I'd probably put it back a bit further than that. It was the "purple fountain" I was thinking of. Garden at front is quite long and tapers off at gate. I'll google weeping ash now! parrotica persica you dont want this wide low tree check it out in Bots in front of canteen. Jeez who you asking for tree prices Try Campbell plants for specimen trees. It is quite a good idea to move semi mature trees. There are three levels of tree spades, tractor mounted, JCB mounted and very large scale truck mounted. Of the three the mid one seems to make a lot of sense because it is used with a local JCB and can take decent sized trees. The problem is to find a suitable tree to move because ideally they need to be set up for moving with clipped roots. 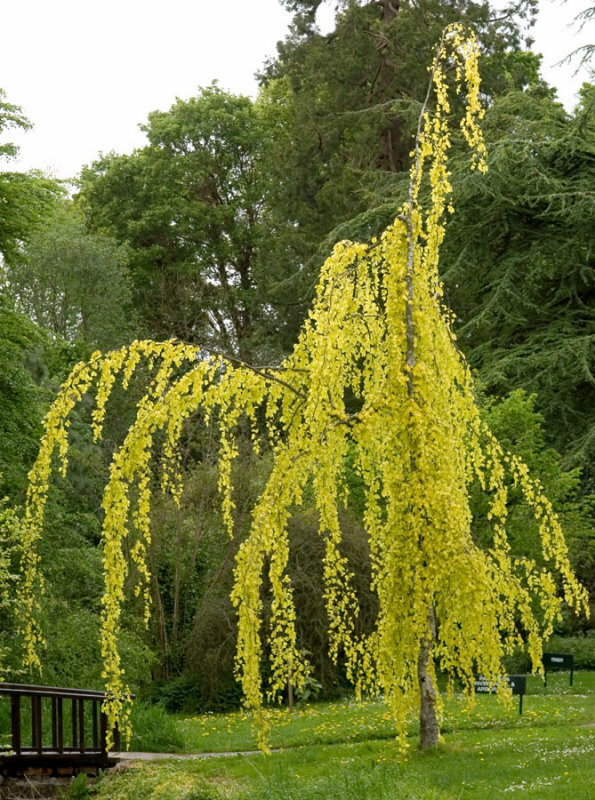 The tree below is a golden weeping beech, not a copper one but it does seem to be popular judging by the number of times the photograph below is viewed. This size of tree could easily be moved with a medium sized tree spade. If a nursery told you that you could plant any kind of beech 4m from the house, they're talking dangerous rubbish. Never go there again! I, too, would be a bit nervy about any kind of beech near the house. They may be slow growing ... but oh boy, do they get there in the end ! I'ld hate to plant something today in the knowledge that -- as has already been mentioned -- it may have to be taken down at some future date. If you want some "local" advice, you could try Calumet Nurseries, Kilquade, (National Garden Exhibition Centre). I've been buying from Tim Wallis for the last 30+ years and he's never yet led me astray. You might even get a few ideas from wandering around the exhibition gardens ! I've also found Scalp Wood Nurseries (Southside, so reasonably local) to be very helpful when buying both young and more mature shrubs/trees. Both these ar reputable suppliers and good garden people who know their stuff but whatever you buy will be imported, buy something homegrown that has already acclimatised or it will be another problem to add to your troubles trying to get it established. How many time s has it crossed the sea, how was it transported and cared for on the journeyto many hauliers involved. You need something that has been handled and moved as little possible. Big trees need as little disturbance as possible. Thanks for all the replies. I AM a bit nervy of a beech so close to the house. I do love them though. The photograph above tells you why! I think the best thing is to go to some of the nurseries mentioned, have a good walk around and chat to the people there in person. Where and what is "bots in front of canteen"???! excuse my idiocy! Does Flannerys talk to ordinary punters? Their site is dealer only? Oh also meant to say, what about a weeping birch?